Packets may be picked up from 8:00-9:00 Fun Run begins at 9:30 and the 5K at 9:45. The Maco Light Legend is a familiar ghost story in Brunswick County. The former Wilmington & Manchester Railroad which runs through the back of Charter Day School’s campus is the scene of the legendary train wreck which caused ghostly conductor, Joe Baldwin, to perpetually roam the tracks. The Maco Light Legend 5K and Fun Run raises funds for recreation programs at Charter Day School, a public, tuition-free charter school. Primary sponsors of this event include The Roger Bacon Academy and Coastal Habitat Conservancy, and the Maco Depot C-Store, among others. 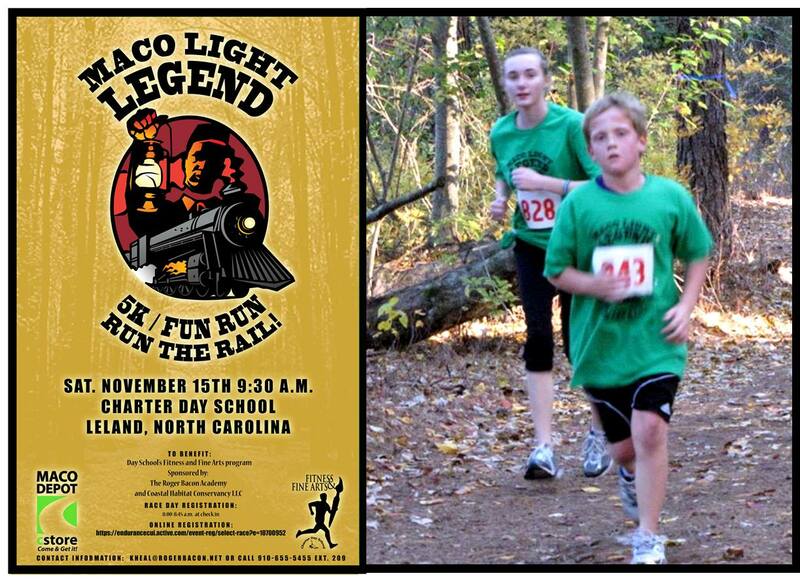 Runners will course through the woodland campus and historic rail bed at the heart of the Maco Light/ Joe Baldwin legend. The post-race party will feature vendor/sponsor booths, refreshments, entertainment and awards. Participants are encouraged to pre-register, as registration fees will increase on the day of the event. The pre-registration cost on or before Nov. 14 for the 5K is $25, increasing to $30 on the day of the event. The pre-registration cost on or before Nov. 14 for the Fun Run is $10, increasing to $15 on the day of. The first 200 pre-registered individuals will receive a free T-shirt. To keep runners and walkers hydrated during the race, the course will provide Maco Light Legend-themed water stations. Jean Lafave at (910)655-3600, ext. 235, or email jlafave@rogerbacon.net.